i dont think this is the correct spot to post this but i figured maybe someone would know here, every online shop ive visited has extreme shipping costs to canada, ($20-$33 shipping) just for a small amount of homemade food. Re: hermit crab food shops located in Canada? Is Canadian Crab Connection still open? It's really hard to send food items from the US to Canada. There are strict laws about what plants are permitted, and not a lot is allowed through. If the packages are caught with things that aren'y allowes then everything gets destroyed and both parties can get in trouble. The actual postage costs are also crazy! wodesorel wrote: Is Canadian Crab Connection still open? if you're looking for some food, check out TheHealthyHermit on etsy. it's an HCA member's store. My crabs love everything i've ordered! ciaraalston wrote: if you're looking for some food, check out TheHealthyHermit on etsy. it's an HCA member's store. My crabs love everything i've ordered! They are not located in Canada and would not be able to send food items there. I currently have my shop on hold due to being overwhelmed with orders, zoeae, and heath issues, but I have shipped to Canada with no issues. I have also shipped internationally with no issues. Postage is ridiculous, and for some time I know that their was a strike with Canadian postage. My stepson lives in Canada. We usually save stuff up and ship things just a few times a year because postage is so crazy expensive. Have you checked out the safe food list, as well as the unsafe food list? Foods should be organic when possible. Hermit crabs are sensitive to pesticides and fertilizers. Make sure that you provide calcium sources for them also Eggshells, cuttlebone, coral, etc. 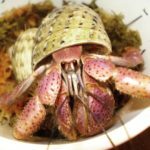 Hermit crabs can eat a lot of the foods that we eat. You can also check out the reptile section of the pet store and get some goodies there. Good luck! GotButterflies wrote: I currently have my shop on hold due to being overwhelmed with orders, zoeae, and heath issues, but I have shipped to Canada with no issues. I have also shipped internationally with no issues. Postage is ridiculous, and for some time I know that their was a strike with Canadian postage. And thanks to everyone else for the info! Oh! For some reason I thought opposite. Sorry! It appears that they are able to ship to Canada so I was in error. We've had vendors in the past who had trouble so I assumed that was still the case.